Here in the beautiful city of North Bay, just 180 minutes north of Toronto, you'll discover three easily accessible campuses - the Aviation Campus, Commerce Court and the Education Centre, which is situated on a stunning 650-acre wooded escarpment overlooking the city. We also have a new and beautiful campus located in Parry Sound, Ontario, right between Barrie and Sudbury. 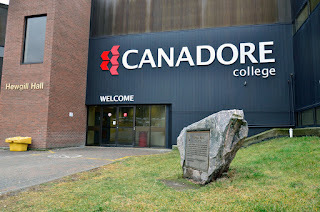 Canadore College is ideally situated in North Bay, Ontario – equal distance from Toronto and Ottawa. The College is close enough to get here quickly but far enough to provide some independence. Canadore is the college of choice for students from across the province and around the world. Our focus is on student success, program and service excellence, connection to community, sustainability and innovation. IELTS requirement is 6.0 Bands with no less than 5.5 Bands, the requirement stands the same for PG Programs also. If the student has a score of above 80 % in Grade X and XII, a scholarship of 1500 CAD in the first Semester Tuition fees will be given. If the student has scored the following in IELTS, the corresponding scholarship will be given in the form of Textbooks.